Welcome to our Spring Front Porch – and it has a new look! You are in for a fabulous treat. Our sweet friend, Kendra, of Joy in Our Home is the creator of this wonderful seasonal tour with 24 of our best designer friends. Each day this week you will see loads of inspiration for Spring decor, DIY’s and recipes. 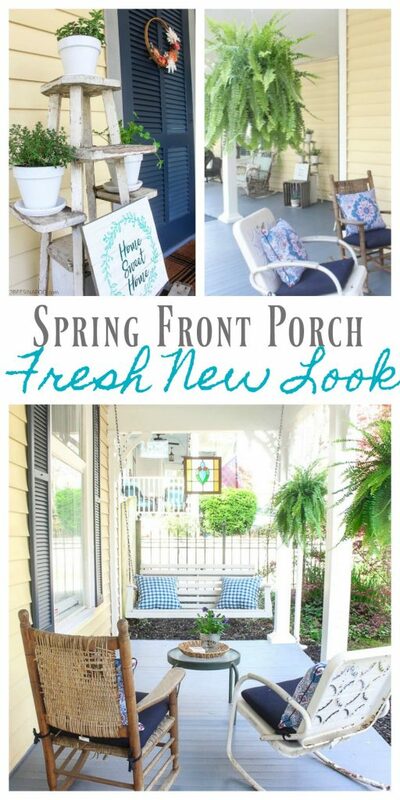 We are so excited to share our spring front porch and it has an update, new look! If you are a new visitor to 2 Bees in a Pod, we are delighted that you are here! 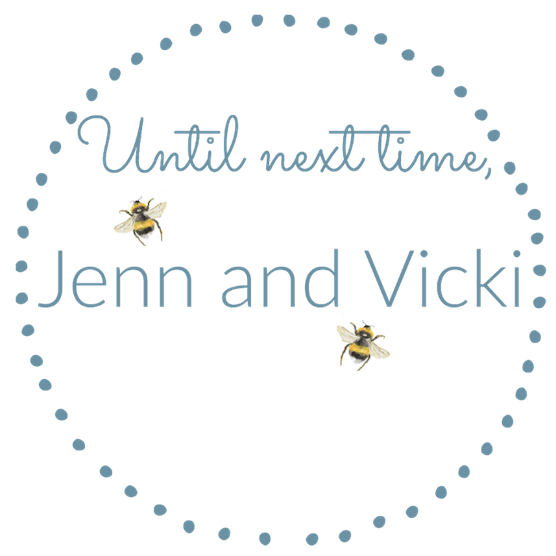 We are Vicki and Jenn, a mother/daughter design team. You’ll find that we love home decor, DIY projects, painting furniture and transforming found objects into something beautiful and useful. 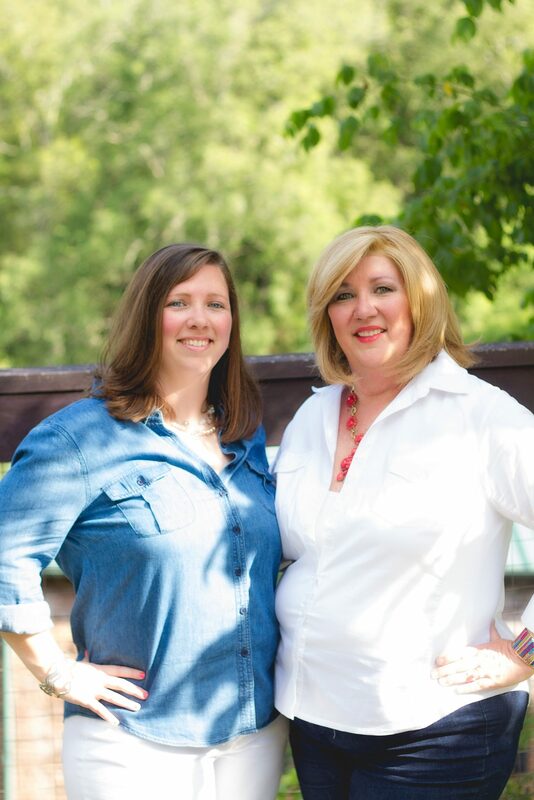 More importantly, we love spending time together! Especially if it’s while, shopping, thrifting or traveling together. 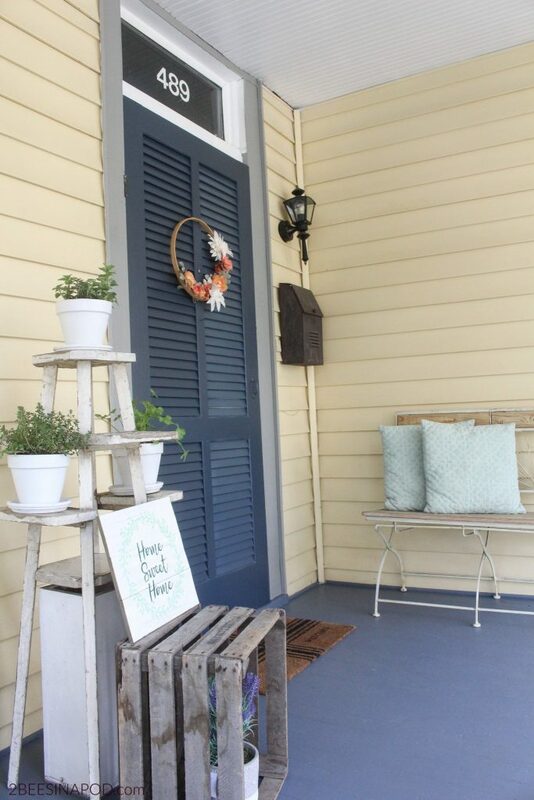 We’re so excited to share with you our Spring front porch! One of things that sold us on this house was the massive front porch. We could imagine ourselves out here relaxing with a good book, or our morning cup of coffee. If you joined us on Monday, you would have seen the sad and depressing before of the front porch. It was in desperate need of some new paint and life. You can see that post here. We painted the shutters, front door, and porch floor, which made such a difference. Now with some fresh paint and spring decor, it’s a much more welcoming spot. 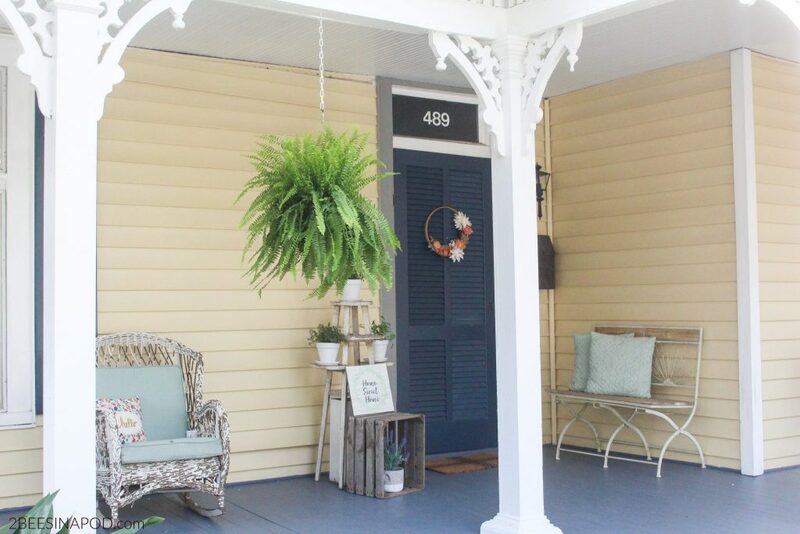 Ferns on this front porch make all the difference. We love putting them out each spring and bringing a little life back into the space. Plus, they fit in so well with the character of this 1901 Victorian home. We can always count on HomeGoods for great exterior pillows. And let’s be honest, for interior pillows too. 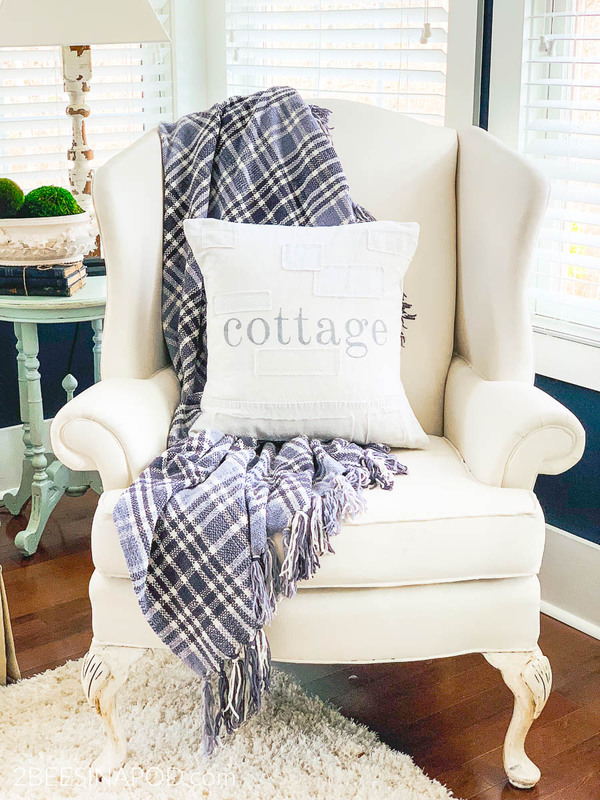 These pillows add just a little more pop of color for spring. They also had these adorable Georgia coasters that could not be passed up. 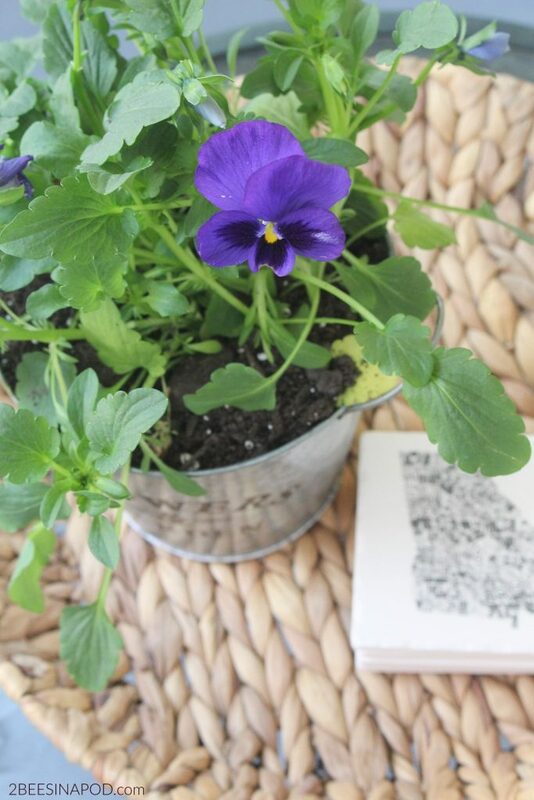 This planter was a find at the Dollar Store last year and is great for some simple potted plants. Before we spruced up the front porch, the door had been white. Which was absolutely fine, but we wanted to add a little pop. Painting the front door was such a great idea. The embroidery hoop wreath we made, which you can see here, really stands out against the gray. Just some simple potted plants by the front door add a little greenery. 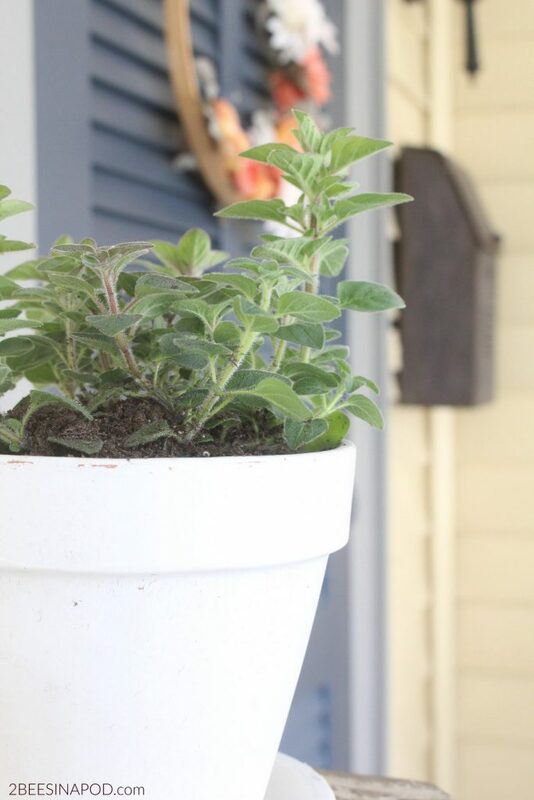 We just potted some fresh herbs, which we can always use, in some terra cotta pots we painted white forever ago. Thank you for joining us on our Spring Front Porch tour. It’s definitely a spot in our home that we love to spend time in and have been taking advantage of the beautiful weather we’ve had recently. Also, be sure to visit our other friends on the Spring tour below. Beautiful job on your front porch. Really love the accent paint color too! I see morning coffee and cocktails on the veranda in your very near future. I love your spring porch! Each space seems so cozy and your seating is fantastic. Love each piece! 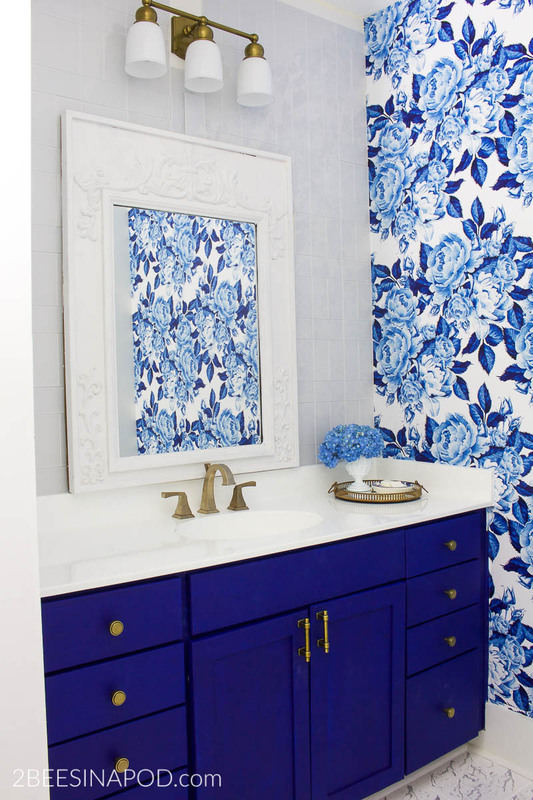 Even the color of your home is perfect for spring. 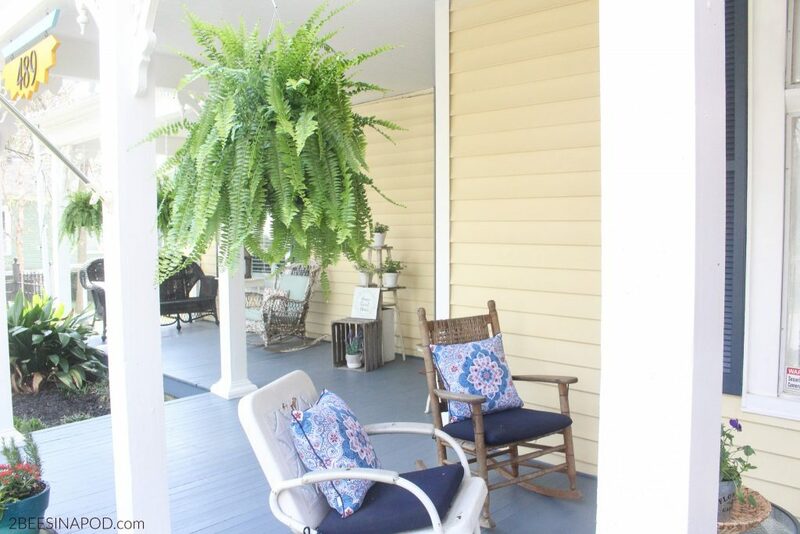 I’ve always thought hanging ferns are the most beautiful plant on porches. I can’t keep them alive for anything. 🙁 Excited to hop with y’all! Love the new colors! I also love the pillows you found and your seating area!! The plant holder is so cute! I agree ferns are so perfect on a porch!! Your porch looks beautiful for spring and I know it will be lovely in summer too! I love the little stained glass hanging above the swing. The herbs in the white pots are so cute too! 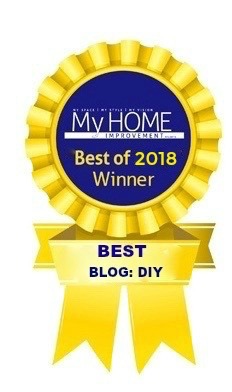 I hope you get lots of enjoyment out of your pretty porch makeover! So glad to join you this week for the hop. Have a beautiful spring! So pretty and fresh! 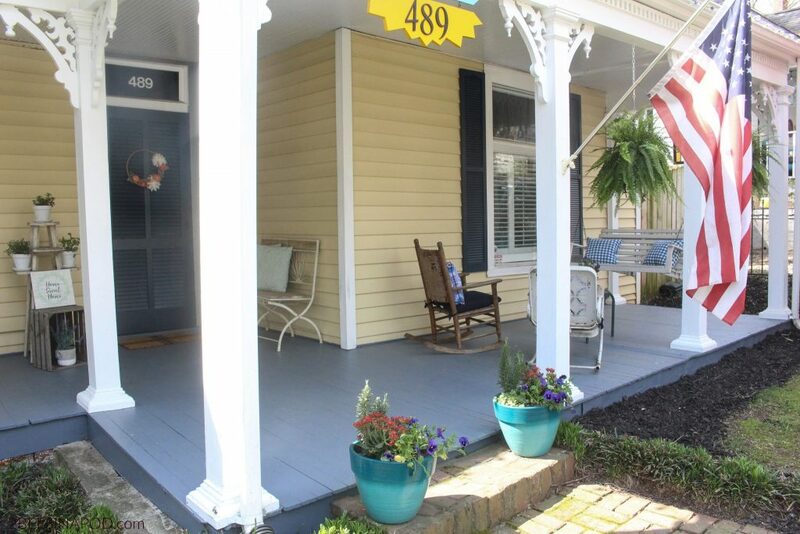 Your home is adorable and your porch looks ready to welcome friends for a glass of sweet tea and a nice long chat! Happy to join you this week! You guys! 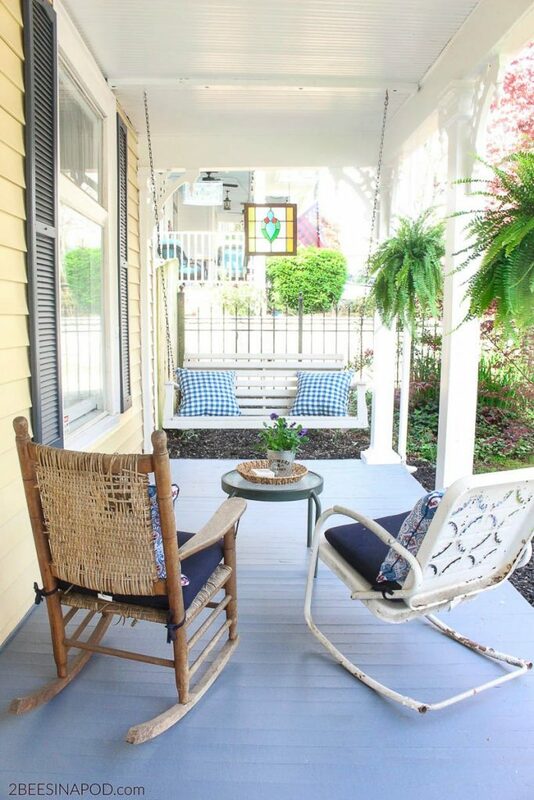 This porch is so charming and welcoming! I’m so happy we are hopping together! What a beautiful and lovely porch you have!!! 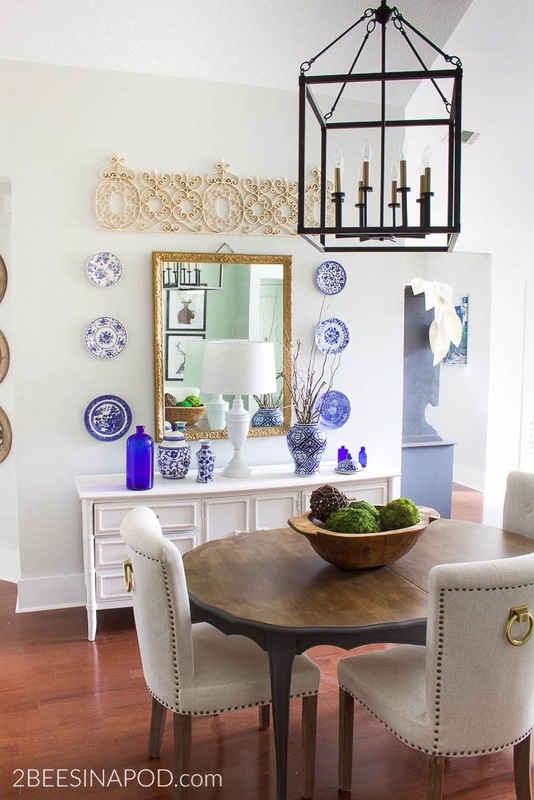 I love your front porch refresh! The seating area is amazing and so inviting! 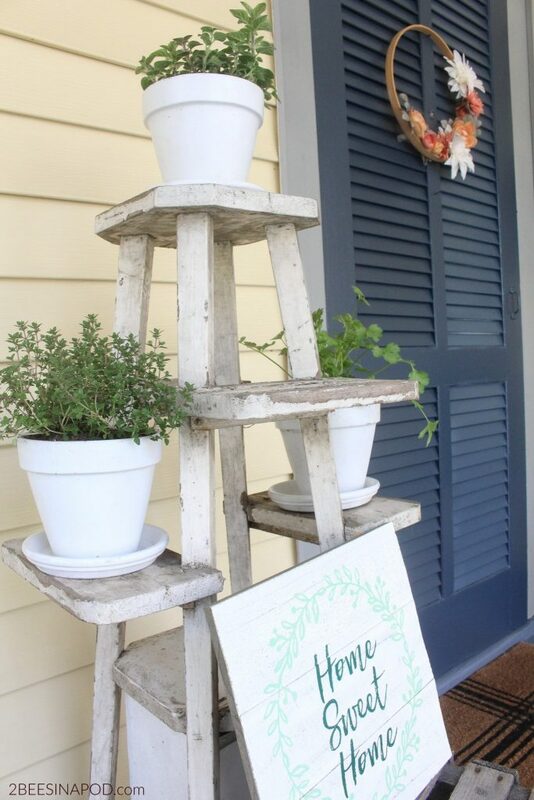 And I love that plant stand! So happy to be hopping with you this week! 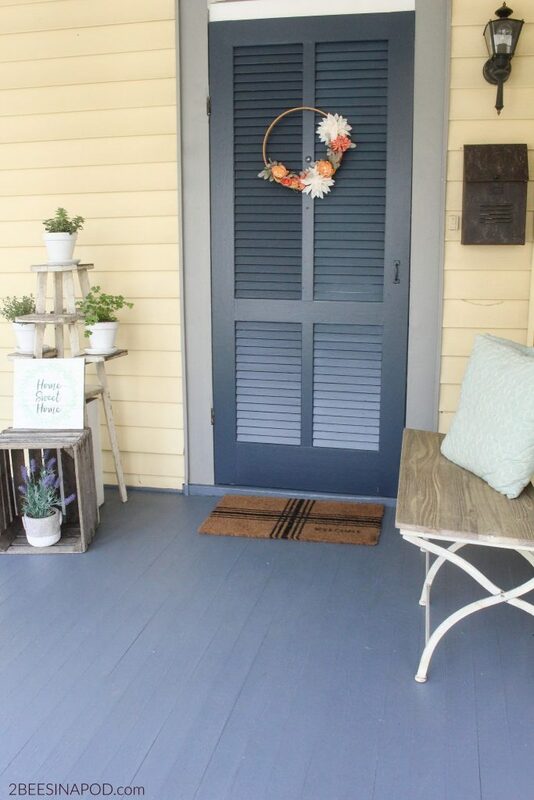 Your porch is so inviting and so pretty with the pops of blue! I can totally see sipping coffee (or something ;)) out there. What a beautiful and welcoming retreat! I love how perfect this is for the season! It was a fun time hopping with you this week! So cute! I love that little stand the plants by the front door are standing on! I would totally love to have that! The plants really do make a difference, I need to do this to my front door area!! Thanks for the inspo! !